Kuvista huolimatta helmet ovat luonnossa hyvinkin aniliininpunaisia ja rannekoru on solmittu valkoiseen helmisilkkiin. Korvakorut on pujoteltu pallopäisiin korupiikkeihin. Molemmissa hopeaosat. 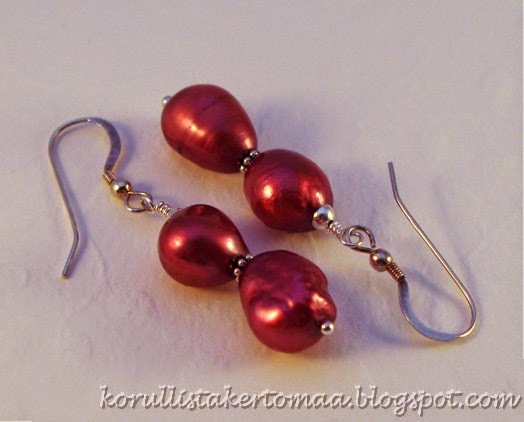 I have earlier made a freshwater pearl necklace and was now asked to make a bracelet and earrings too. It was challenging to find the right color but I succeeded quite well. 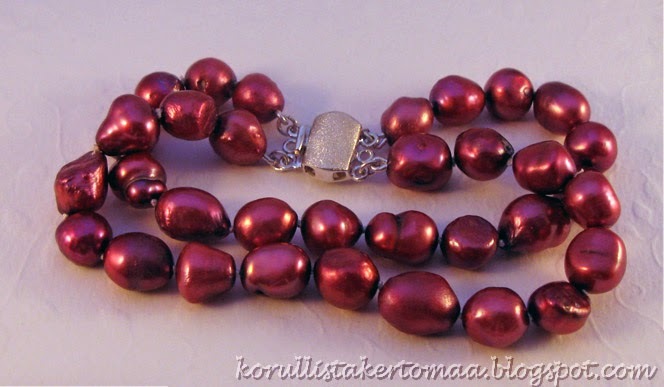 This bracelet is made from magenta freshwater pearls and it is hand strung on silk. Earrings are strung on thin sterling silver headpins.